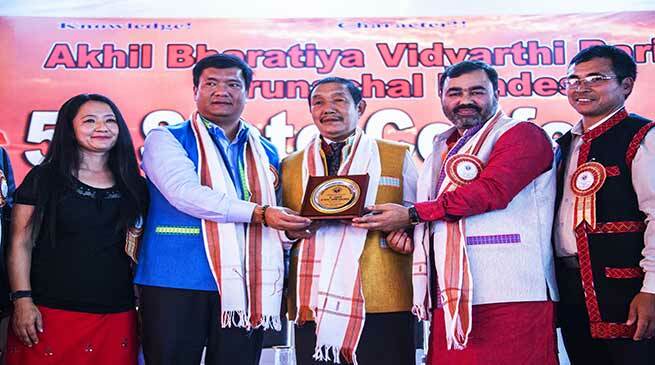 The Chief Minister Pema Khandu today lauded the contribution of Akhil Bharatiya Vidyarthi Parishad (ABVP) in nation building. He requested the students to be attentive in the conference and take back whatever is taught here to their friends and community urging them to help in spreading the message of nation building and youth empowerment. The Chief Minister was addressing the 5th State Conference of ABVP held here at Hangpan Dada Sabagarh that saw participation of about more than 500 students from various districts. He advised the students be aware of bad influence and wrong company. He urged them to focus on building a good foundation for their career and said that ABVP provides that right platform to build self-discipline. The Chief Minister also advised the students to preserve their mother tongue and to always speak in their own native dialect. He said language helps preserve our culture, as it is the best medium to understand one’s own culture, tradition, folklores and history. He informed the students about various policies initiated by state govt for youth empowerment, skilling and employment. He advised them to focus on studies and rise to the expectations of parents. The Chief Minister urged the organizers to conduct the conference at district level and to increase its membership drive. He hoped that platform provided by ABVP will help bridge communities. The Chief Minister appreciated the ABVP for launching an innovative project Students’ Experience in Inter-state Living (SEIL), which aims at overcoming the challenge of alienation among Northeast student by organizing cultural exchanges and tour to various parts of India. Khandu also recalled the contribution of Nagaland Governor PB Acharya who during his early days undertook the mission for integrating the people of Northeast with rest of the country. Earlier the Chief Minister felicitated Social worker Anong Jongkey for his contribution towards in building a better society.